BMW R1200C Windshield Low Boy Heavy Duty Style Windscreen N2221 ABE Approved. The Low Boy Heavy Duty is 125mm shorter than the Custom. It's designed for the medium to shorter riders, and adjusts up to 1-1/2 inches in height. National Cycle Heavy Duty Windshields are made of 3mm thick, GE Lexan Hard Coated Polycarbonate. Made From Lexan® FMR Polycarbonate - Lexan Polycarbonate with FMR hardcoat is the highest quality motorcycle windscreen material available. It is virtually unbreakable, optically superior and can be repeatedly cleaned using conventional methods without scratching. 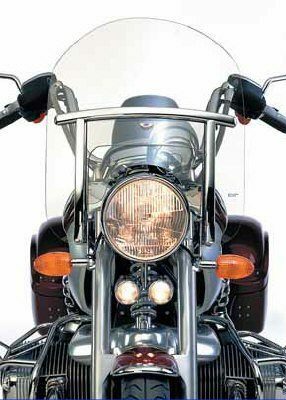 Lexan FMR polycarbonate is the OEM motorcycle industry standard and was proudly developed for the motorcycle industry by National Cycle, Inc.